In his talk, Barry described Magna Carta’s origins and development, appearance, content and interpretations, its status and influence in the world, and the marketing associated with it. Dr Ardley pointed out that ‘from a linguistic perspective, there are many implications flowing from the fact that the Magna Carta was written in Latin and the King - who could not write - and the barons, spoke French. The peasants, who were illiterate, spoke English.’ He said that Lincoln’s copy of Magna Carta is owned by Lincoln Cathedral and is one of only four copies to survive from 1215; following many travels over the years, it is now housed with Lincoln’s Charta of the Forest in the state-of-the-art subterranean Magna Carta vault, which was built as part of the 22 million pound project on Lincoln Castle that took place between 2011 and 2015. Barry concluded by saying that a ‘medieval political settlement, signed in a muddy field on a small island’ has been transformed ‘into something that is held to have very great significance today’. 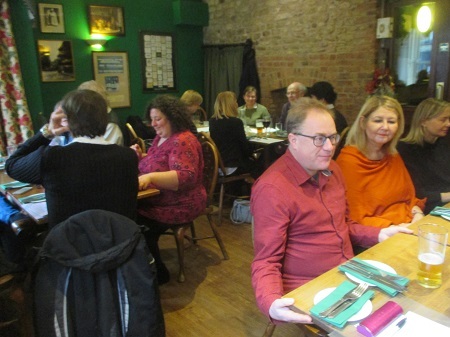 The event was very well attended, with time for networking and discussion, as well as for eating a delicious lunch. 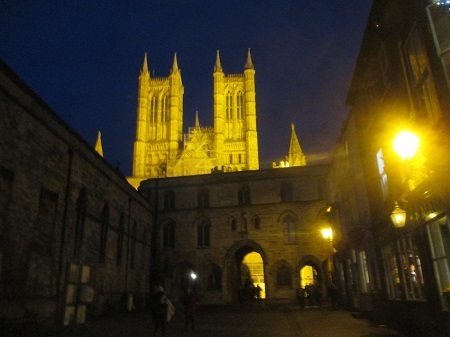 We were able to enjoy Lincoln’s Christmas lights and decorations as we left the venue, as well as admiring the golden light on the Cathedral. Barry Ardley will present a talk entitled ‘The Lincoln Magna Carta: Interpreting a Memory of the World’, which will be followed by a Q&A session and networking. Prior to the talk attendees are welcome to join for lunch (at their own expense) at the Wig and Mitre.